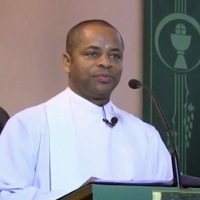 We are happy to announce the imminent arrival of Father Innocent to St. Bartholomew's as our new Curate, and look forward to welcoming him as he begins his priestly ministry among us over the weekend of 11/12 February 2016. We wish him every blessing as he joins us. His birthday is January 3rd. Ordained on 24th August 2002, he is a priest of the Diocese of Orlu in Imo State, Nigeria. He was appointed Assistant Chaplain to the Nigerian Catholic Chaplaincy in the UK in April 2009, and Principal Chaplain in January 2016, which post he relinquished in December that year. It was during this period that Ged joined the various activities that the Parish offered – he was a part of the 32nd Scout group and the St Bart’s football team where he played football under the guidance of the ‘legendary football coach’ Eddy Sanders. Ged was asked to be an Extraordinary Minister of Holy Communion by Fr Richard Whinder. He was then asked to become a catechist by Fr Tom Cooper (prompted by Maria Lopeman). All of these factors alongside Deacon Paul’s Vocation Homily were strong influences in motivating him to make an enquiry about the permanent diaconate. A wonderful journey which culminated in Ged being ordained a deacon on 17th June 2016. "…holiness doesn’t mean doing extraordinary things but doing ordinary things with love and faith”. Therefore, through God’s grace, Jesus Christ’s inspiration and the Holy Spirit’s guidance, Ged hopes to serve wider St Bart’s community for many years to come.